Posted August 13, 2015 & filed under Children's Oral Health and Fluoride. 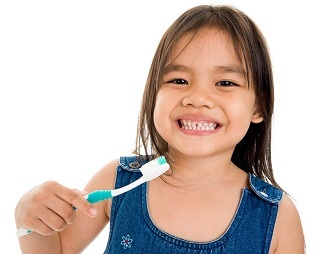 Healthy gums and teeth are important to your child’s overall health. This is why your child’s doctor will talk with you about good dental habits even before your child’s first tooth appears. Once your child has a tooth, your doctor or dentist may recommend that your child receive fluoride varnish treatments in the office to help prevent tooth decay. Fluoride varnish is a dental treatment that can help prevent tooth decay, slow it down, or stop it from getting worse. Fluoride varnish is made with fluoride, a mineral that can strengthen tooth enamel (outer coating on teeth). Keep in mind that fluoride varnish treatments cannot completely prevent cavities. Fluoride varnish treatments can best help prevent decay when a child is also brushing using the right amount of toothpaste with fluoride, flossing regularly, getting regular dental care, drinking tap water with fluoride, and eating a healthy diet. Fluoride varnish is safe and used by dentists and doctors all over the world to help prevent tooth decay in children. Only a small amount is used, and hardly any fluoride is swallowed. It is quickly applied and hardens. Then it is brushed off after 4 to 12 hours. Some brands of fluoride varnish make teeth look yellow. Other brands make teeth look dull. However, the color of your child’s teeth will return to normal after the fluoride varnish is brushed off. Most children like the taste. Fluoride varnish is painted on the top and sides of each tooth with a small brush. It is sticky but hardens once it comes in contact with saliva. Your child may feel the hardened varnish with his tongue but will not be able to lick the varnish off. It does not hurt when the varnish is applied. Fortunately, brushing on the varnish takes only a few minutes. Visit HealthyChildren.org – Fluoride Varnish: What Parents Need to Know for more information from the American Academy of Pediatrics (AAP) about fluoride varnish and oral health.